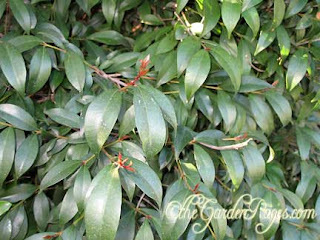 Brush Cherry, or Carolina Laurel is a pretty, dependable garden shrub that grows quickly into screens or hedges. These shrubs can grow up to 30 feet tall and 10 - 12 feet wide. I have seen mature stands of Carolina Laurel grow even taller. Carolina Laurel is versatile too, growing in full sun to part shade. Once established they can survive drought conditions and are pretty low-maintenance. However, in desert areas they prefer less sun and will appreciate more water during the hottest summer weather. Keep an eye on the leaves. If they wilt give them some water. I little watering trick I use in hard clay soil is this; give the shrubs a small amount of water at first, then wait an hour or so for the soil to absorb it and loosen up. Then come back and water them a second time. The objective is for the water to go down deeper into the soil to the roots. This also encourages deep roots which helps any plant to survive drought better [-- see how this all fits together in your Master Plan of a Carefree Drought Tolerant Garden?]. Follow up with a little mulch of compost, dead leaves or dry, loose grass clippings to hold moisture around your shrubs even longer. A few times I've had a Brush Cherry or two succumb to an especially hot snap and lose all their leaves. After an extra deep watering (without water-logging the soil), an apology and a few months wait, they came back. Don't give up on them too soon if you think they're dead. Just trim off the dead leaves and wait. If you are growing Brush Cherries for hedges, they have a dense growth habit with lots of branches so they don't mind a heavy shearing every few months. 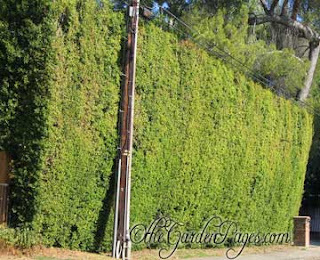 They are also easily trimmed into simple shapes or fantastical living sculptures as topiaries. New leaves are a pretty reddish rusty color, seen mainly in the spring. Mature leaves turn a darker, deeper green. They get sprays of white flowers followed by clusters of small, bright red cherries that give Brush Cherry their name. The only complaint gardeners may have about these shrubs is that the cherries can stain your concrete and make a mess if you don't keep them picked up. If you don't have enough birds in your area to take care of the cherries for you, just trim off the flowers before they set fruit. This will also relieve the plant of the stress of producing seeds.